> How much faster is the R35 GT-R compared to its predecessor? 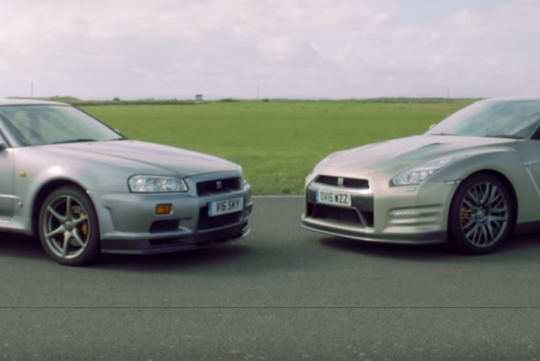 How much faster is the R35 GT-R compared to its predecessor? Launched in 1999, the R34 Nissan Skyline GT-R is now almost 16-years old. Back then, with 276bhp from a 2.6-litre turbocharged inline-six cylinder engine, the Skyline GT-R was one of the best and fastest cars on the track. So, fast forward to the present, how does it compare to its newer and much faster successor, the latest model of the Nissan GT-R family, the 45th Anniversary limited edition?